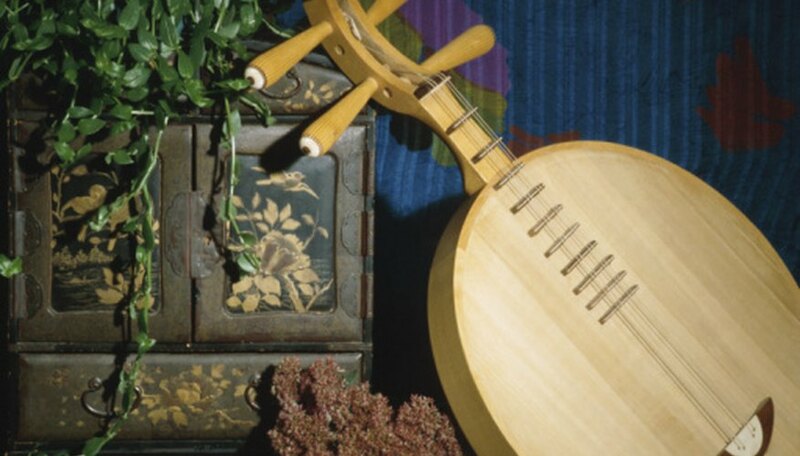 Traditional English musical instruments played a major role in entertainment for the people of the Middle Ages through the start of the Baroque period -- approximately 476 AD to 1750 AD. Many instruments used in the music of the time formed the basis for instruments we know today. Traditional English music has a long history encompassing several instruments every enthusiast should know. Whether you're a serious performer or an audience member, these instruments provide a basis for understanding traditional English music. Stringed instruments have plucked or bowed strings. The harp is well-known throughout history. In English music, harpists played fast glissandos, which smeared the notes between pitches, and elegant melodic lines. According to Iowa State University, little is known about the harp and how it was used, but it had "an important role in legend and folklore." Harps were most likely used as instruments to accompany roving troubadours. The lute is another common instrument in English music, typically used to strum melodies and help accent chords with the harp. Wind instruments use the player's breath to produce sound. Some create sound using vibrations made with the lips, while others require the player to push through large amounts of air. The flute, one of the most common instruments in this period, differed somewhat from the modern flute, which uses depressed keys to produce pitches. Flutes in early traditional English music had keyholes players covered with their fingers. The flute was a melodic instrument that coupled well with the harp. Trumpets were usually made of brass, but unlike trumpets today, these early versions had no valves. They played pitches based on the overtone series: progressively smaller intervals as the instrument plays higher notes. The series starts with an octave, which is the distance of eight notes, then a 5th, and proceeds upward, cutting the previous interval in half each time. The shawm, which may have been an early clarinet, used a reed to create vibration coupled with the air pushed through by the player. This instrument had holes the player covered to create different pitches. Another wind instrument was the sacbut, which has a modern counterpart in the trombone. The sacbut used a slide to change individual pitches. It operated much like a trumpet, but with a single slide instead of valves and could play all 12 pitches between octaves, which are simply the distances between one note and the next. Percussion instruments are struck or hit to produce sound. The percussion instruments of traditional English music are very much like those today. Drums, cymbals, triangles and tambourines were used to add accents and provide a background rhythm to keep tempo and differentiate beats. Keyboard instruments use keys to strike or pluck strings, creating resonance and vibration. Some keyboards traditionally used in English music were the harpsichord and its smaller counterpart, the spinet. Other than the size, they're the same. The harpsichord and spinet work similarly to a piano and use a plectrum, or quill, to pluck rather than strike a string. A plectrum is very similar to what modern guitarists use to pluck the strings of their guitars. Spinets and harpsichords could only play at one dynamic level, though composers could add pitches to create louder sections within a piece. The organetto was a small version of an organ that actually sat in the player's lap. Similar to an accordion, a pump on the side of the instrument pushed air through the pipes attached to the keyboard. When keys were pressed, air was redirected to corresponding pipes, creating pitch.